Libraries have been integrated into the Windows 7 operating system by Microsoft, to provide users with an option to manage files residing in multiple different directories. That's for instance helpful if videos, photos, or music are not stored in just one directory on the system, but in multiple locations. Users have options to create new libraries, and add storage locations to existing libraries. That's however not as comfortable as it may sound, as it requires to right-click on the library in Windows Explorer and to selected Properties from the menu. If this has to be done for multiple libraries, or regularly, then it becomes a nuisance. Librarian is a specialized tool to manage Windows 7 Libraries more effectively. The program displays all existing libraries in the user interface. The main controls in the program can be used to create a new library, rename or delete an existing one, or change the properties of the selected library. A double-click on a library in the listing opens the settings of that library. 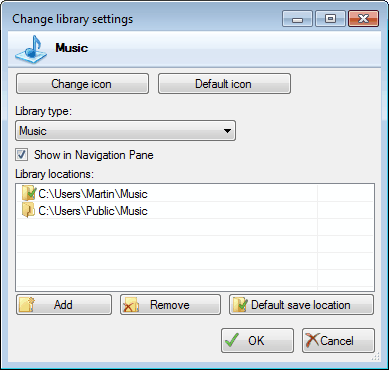 Here it is possible to change a library's icon, revert to the default icon, switch the library type, add additional storage locations and select if it should be displayed in the navigation pane in Windows Explorer. Finally, the default save location for the library can be set here as well. The default save location is indicated with a checkmark on the icon. All options provided in the software are also available in the operating system. The major difference is their accessibility. Users who regularly work with libraries, or need to configure them extensively may prefer to use Librarian, as the software makes it a tad easier to do so. And thanks for “Personalisation panel” too.